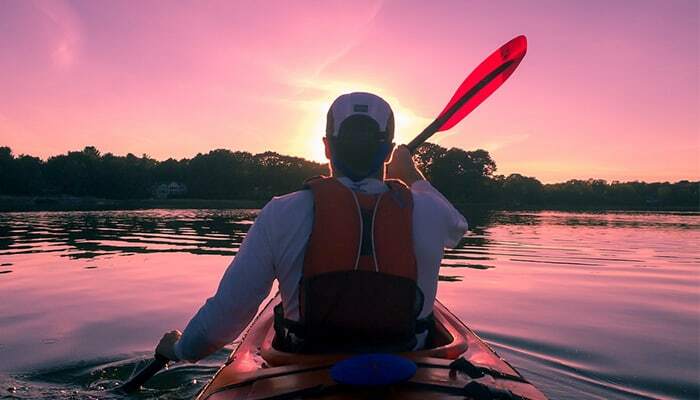 It’s no secret that kayaking is an excellent full-body workout. 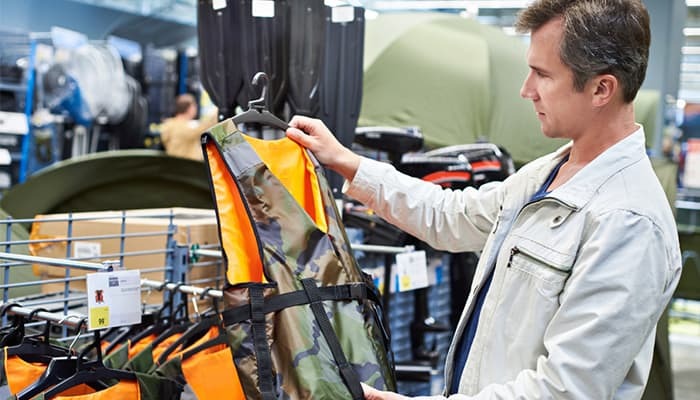 It’s important, however, to ensure you’re in kayak-ready shape even before venturing out on the water. Implementing a strength training and cross-training program will enhance your experience, improve performance, and help ward off injuries. 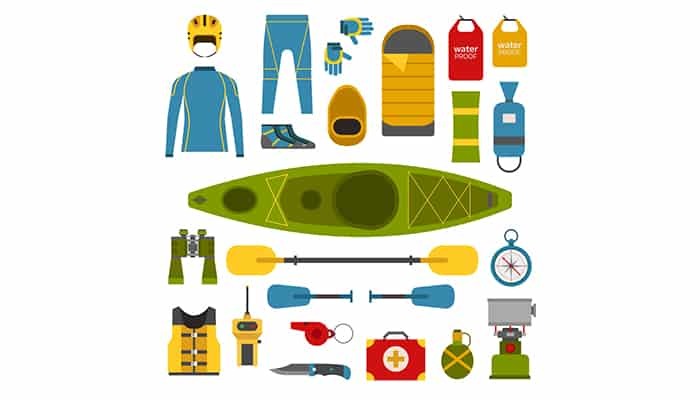 Whether you’re a kayaking newcomer, or you just want to up your kayak game, the following training guide will help keep you fit and ready for your next paddling adventure. Note: Always check with your healthcare provider before starting a fitness routine. 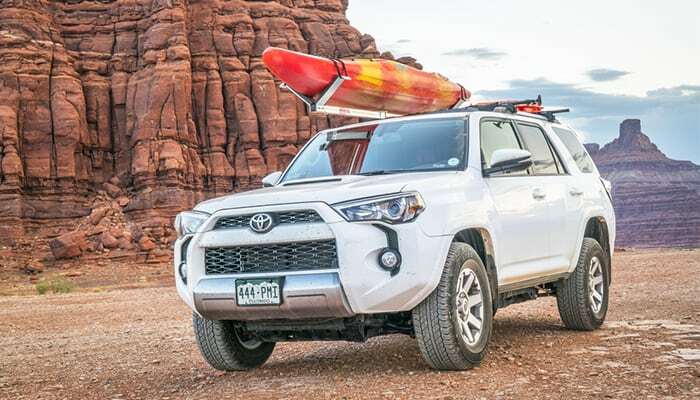 It’s the perfect day for kayaking, and you can’t wait to hit the water. Before you head out, you need to warm up those muscles. Take 5 minutes to perform active stretches that focus on muscle groups you’ll be using while paddling. The following exercises take very little time and make a big difference on the water. Grab your paddle and a medicine ball, and let’s get started! Arm raise: With your paddle in both hands and parallel to the ground, extend your arms and lift them over your head with the palms of the hands facing the ground. Your upper arms should remain parallel with the ground. You should feel the stretch in the inner shoulder region. Raise the paddle up and down slowly 5-10 times. Side bend: Stand up straight with a weight in your right hand and your left hand on your hip. Bend at the waist to the left without moving the rest of the body. Now, bend to the right, then change sides. Repeat 3-5 times on each side. Hamstring stretch: Lie on your back and place a band or strap around the ball of your foot. Raise your leg 90 degrees from the ground, or until you feel the stretch. Pull on the band for a deeper stretch. Flex your foot and hold the stretch for 15-30 seconds. Repeat 3-5 times on each leg. Lunge with a twist: Hold a medicine ball or weight with both hands and step forward with your right leg, making sure your right knee is over your ankle. Twist the upper body to the right; do not twist at the knee. Walking straight leg kick: Face forward while standing up straight, and raise your right leg up in front of you as far as possible. With your left hand, reach for your right toes. Release leg, and repeat on the other side. Repeat 3-5 times on each side. Note: Don’t forget to repeat these stretches after your water adventure. 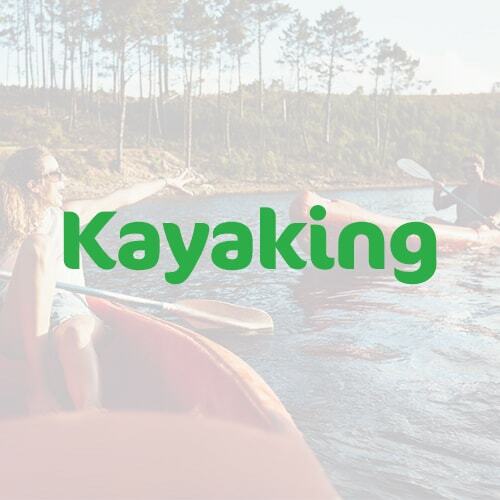 If you’re in excellent aerobic shape, you’ll enjoy kayaking that much more. 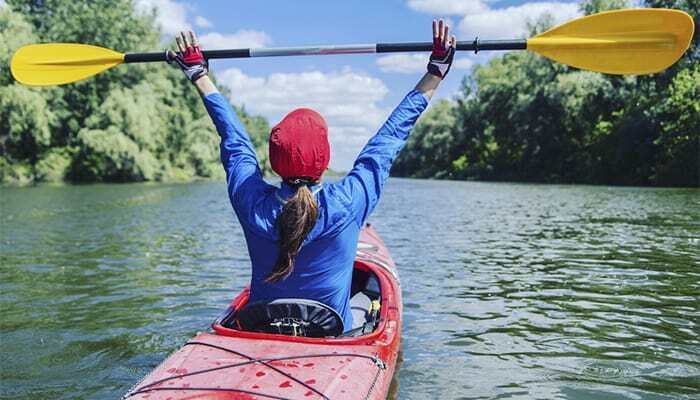 Taking part in aerobic activities between kayaking sessions will improve your overall fitness and performance level, and reduce the risk of overuse injuries from paddling. 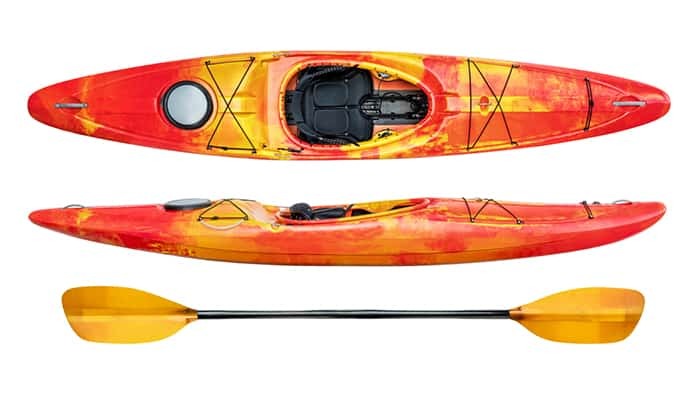 Swimming is a full-body workout that complements kayaking perfectly. Whether it’s lap or open water swimming, you’ll be working the muscles of the upper back, core, and legs—all of which you need to paddle efficiently. 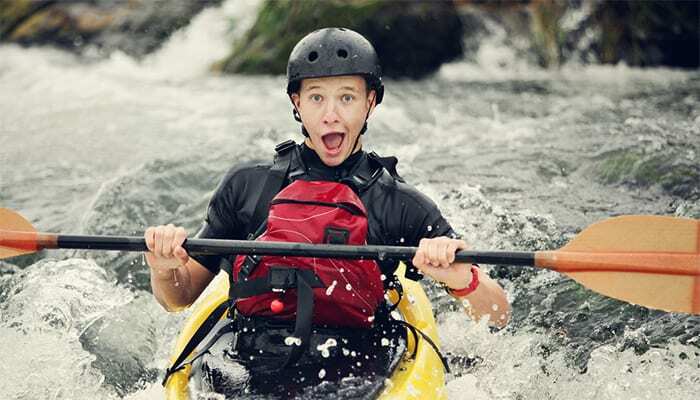 Plus, you’ll get plenty of practice for those times you wind up in the water while kayaking. In addition to cardio, adding a strength training routine to your fitness regimen will keep you strong and ready to paddle. 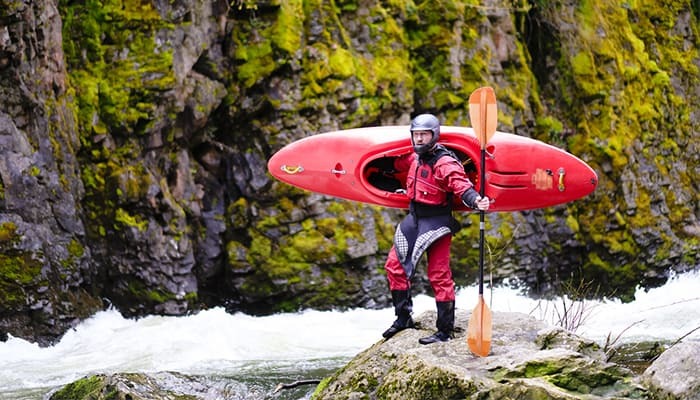 Overuse injuries are common among kayakers, due to the repetitive motions. Incorporating a resistance routine anywhere from 1 to 3 times each week will strengthen the muscles necessary for your on-the-water adventures. Note: Rest is important. You’ll want to take 2 full days off between strength training sessions. Be sure to warm up each time, taking 5 to 10 minutes for light aerobic activity. For resistance exercises, use moderate resistance at first, and make adjustments as needed. Try 2 to 3 sets per exercise, and aim for 10 to 15 reps each. You’ll need a bench, a set of hand weights, and an exercise ball to get started. Many of these exercises can be modified to meet your individual needs. Hay baler: Kneel on the right knee with the left foot in front of you and the knee bent. Hold a medicine ball in both hands, engage the core, and bring the ball to the right hip, being careful not to twist the torso. Bring the ball up and across the body, keeping the head, chest, and hips facing forward. Repeat the motion slowly. Wood chop: Stand up straight with your knees shoulder-width apart. Holding one dumbbell, rotate the torso to the right and raise the weight over the right shoulder. As you bring the dumbbell across the body and lower it to hip level, squat your legs. Repeat on the other side. Bicep curl: With one weight in each hand, tuck your elbows into your sides while standing with your legs shoulder-width apart. Bend your knees slightly, and make sure your forearms are facing forward. Bend at the elbow and raise the weights up, feeling the muscles contract. Return to the resting position, and repeat. 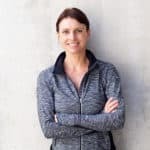 Chest press: Lying on a bench or a mat, place the feet firmly on the floor, and with a weight in each hand, pull the shoulder blades together while lowering the weights until they are parallel with the floor. Hold, then push the arms up. Repeat the motion slowly. One arm row: With one weight nearby, place your right knee on the bench and your left foot on the floor. Hold onto the bench with your right hand, hold the weight in your left hand, and reach forward with the weighted arm held straight. You should feel a stretch in the upper back. Pull the weight up and to the side, using your back muscles. Maintain a flat back position and be careful not to rotate the shoulders. Return to start, and repeat on the other side. Chest fly: Sit on the bench with a weight in each hand. Lie flat on the bench, and bring the weights to the chest. Press overhead, making sure the palms are facing each other. Bend elbows slightly, then drop the arms out to the sides until they are parallel with the floor. Push arms back up to center. Move the weights in a slow, continuous motion. Seated knee-ups: Sit on the bench with your hands planted behind you. With the legs straight out in front of you, begin flexing the knees as high as possible. Slowly bring the knees down until you are in a straight leg position, then repeat. Seated medicine ball twist: Sit on the floor with your knees bent, heels on the ground, and toes in the air. Hold a medicine ball with both hands in front of you, tighten the core, and turn from the shoulders, touching the medicine ball to the floor. Now turn to the other side and touch the ball to the floor. This exercise is best performed in a continuous motion. Bench crunch: Sit on the edge of the bench and plant your hands beside your buttocks. Stretch the legs out in front of you, then bring your knees to your chest. Make sure the core is engaged, and hold the crunch for a second before releasing. Plank: Lie on the floor on your stomach and push yourself up onto your forearms and toes. Keeping a flat back, engage the core muscles, and hold a plank position for a minute to start. Add time as you gain core strength. As you can see, conditioning the entire body is key. 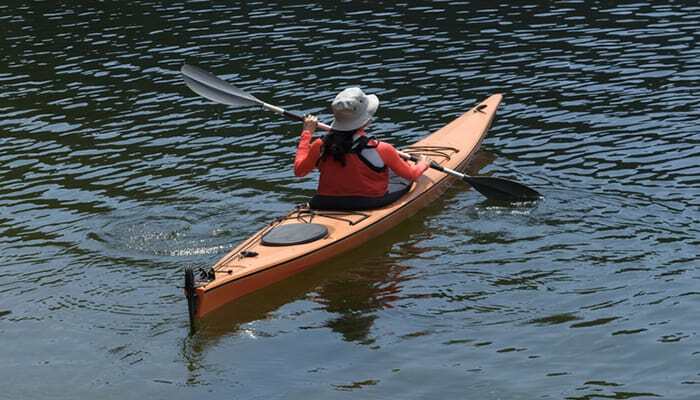 Your cross-training and strength routines will allow you to paddle for hours, and for years to come. 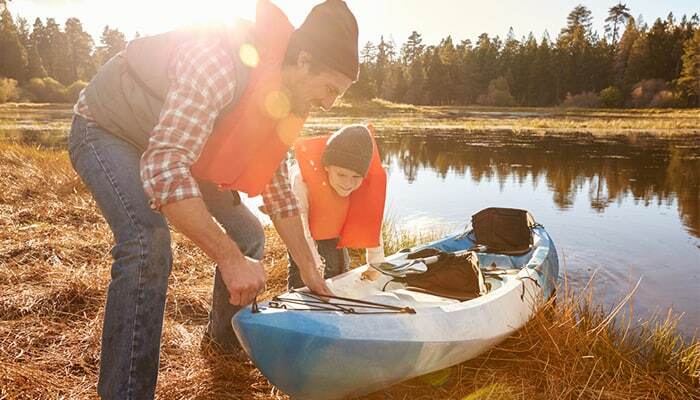 During the off-season, keep up the regimen to ensure you’re ready for action when kayak season rolls around. The effort is well worth the reward.